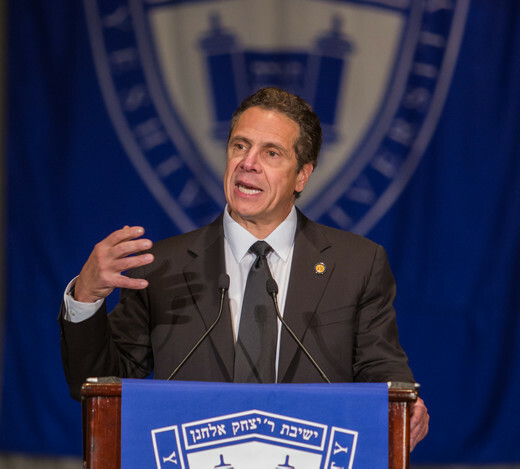 The Honorable Governor Andrew M. Cuomo delivered the keynote address at Yeshiva University’s 91st Annual Hanukkah Dinner and Convocation on Sunday, December 13, at the Waldorf Astoria in New York City. President Richard M. Joel bestowed an honorary doctorate upon Cuomo, the same honor conferred by YU on his father, former Governor Mario Cuomo, in 1983. “As my predecessor Dr. Norman Lamm said in his citation while conferring the very same degree on your esteemed father, ‘You have shown a rare quality of leadership as you have sought ways to make government more humane and responsive to the needs of the citizen,’” said President Joel. “It’s a great tribute to who you are that the same words apply to you. In his address, Cuomo discussed the strong bond between the United States and Israel, and described how the Jewish concepts of shleimut [wholeness] and tikkun olam [repairing the world], which YU embodies, allow society to combat ignorance and hatred. At the convocation, President Joel also conferred honorary degrees upon Dr. Ben Chouake, Norman Sternthal and Mark Wilf. Dr. Chouake, the national president of NORPAC, the nation’s largest pro-Israel political action committee, is a board member of both Yeshiva College and the Bernard Revel Graduate School of Jewish Studies. He and his wife, Esther, established the Esther and Ben Chouake Scholarship at Yeshiva College in 2003. Norman Sternthal serves as a member of the Yeshiva College Board of Directors and director of the Canadian Friends of Yeshiva University. He is co-founder of Groupe Fairway, a Montreal-based real estate and development firm. Together with his wife, he established the Johanne and Norman Sternthal Foundation in Montreal. The Sternthals recently made a benefactor-level gift to Yeshiva University–affiliated Rabbi Isaac Elchanan Theological Seminary (RIETS) to support a special training initiative for pulpit rabbis, known as the Norman and Johanne Sternthal Halakhah L’Maaseh Program. Mark Wilf, co-owner and president of the Minnesota Vikings football team, serves on Yeshiva University’s Board of Trustees. His support of YU is not just a personal cause but also a family legacy. As the son of Joseph and Elizabeth Wilf, and the nephew of Harry z”l and Judith Wilf z”l, Wilf was born and raised in one of YU’s “first families,” a birthright to which he and his wife, Jane, have proudly adhered and instilled in their four children. He is a YU benefactor and serves as a member of the Yeshiva University Institutional Advancement Committee. President Joel also honored Rabbi Dr. Herbert Dobrinsky ’50YUHS, ’54YC, ’57R, ’80F with the Presidential Medallion. Rabbi Dobrinsky began his YU career in 1962 at RIETS, first serving as assistant director and then as associate director of the Max Stern Division of Communal Services. In 1973, he was named executive assistant to then-YU president Dr. Samuel Belkin, and later to Dr. Norman Lamm, YU’s third president, who named Dobrinsky vice president for university affairs in 1981. He is co-founder of the Sephardic Studies Program and the Sephardic Community Activities Program and also established the Sephardic Council of Overseers. During his 53 years of service to the University, he has played a major role in the establishment of 38 professorial chairs and has secured hundreds of scholarships throughout the United States, Canada and abroad, for all of YU’s high schools and undergraduate and graduate schools. Included in the Points of Light were Jacob Bernstein, an instructor of Jewish History at Yeshiva University High School for Boys and a student at RIETS, Revel and Azrieli Graduate School of Jewish Education and Administration, who recently launched the Shmira Project in response to the flood of new terrorism in Israel—a campaign to have Jews learning Torah around the clock to stand guard over the people of Israel. Carmelle Danneman, a Stern College for Women student, who created an award-winning short film based on her own experiences as a medical clown in the pediatric oncology department at Hadassah Ein Kerem Hospital in Jerusalem, was also a Point of Light. Other Points of Light included Nechama Price, a beloved instructor of Bible and Judaic studies at Stern College for the last 11 years and director of its Graduate Program for Advanced Talmudic Studies for Women; Emanuel Alvarez, a Navy veteran looking to provide much-needed social work services to his comrades as he earns a certificate in social work practice with the military at the Wurzweiler School of Social Work; and Leslie Thrope, director of the Center for Public Service Law at the Benjamin N. Cardozo School of Law for the last 11 years. Sy Syms School of Business student Yaakov Feldstein and Albert Einstein College of Medicine student Yosefa Schoor were also named Points of Light for their efforts to spread acts of positivity and kindness to others. Feldstein composed and performed the theme song for this year’s international Dance for Kindness day, “More Light,” which inspired people in countries around the world to perform acts of goodwill for others. As an undergraduate at Stern College, Schoor was a co-creator of TEACH: Together Educating All Children in Hospitals, a program that runs interactive science modules for hospitalized child patients and their siblings. The program has since spread to 11 hospitals and three states. The last Point of Light was Rabbi Dr. Chaim Feuerman, who has served as heads of yeshiva day schools for more than 40 years and is currently professor of education at Azrieli, where he has taught for 26 years. Rabbi Feuerman was recognized for his contributions to the professionalization of the field of Jewish education. Approximately $4 million was raised at the dinner and convocation, which serves as the University’s main annual fundraising event.